As much as I love being a Horror fan sometimes things become, well if I'm honest a bit stale. I know I'm not the only one who thinks this. Again if I'm honest, when I saw the trailer for this film I wasn't expecting that to change (how many times have we been mislead before? ), what followed was a big shock to me. We're introduced to the character of 'Hermann Haig', a man who feels he is destined to be an artist yet there's a problem, he hasn't got any talent whatsoever. That is where our story begins to unfold and what a story it is. The acting in this film is great and the story flows at a nice pace, it creates more questions than it answers but that adds to the film's strange, twisted and highly compelling story. People who have read my reviews before will know that I don't like to give too much away and this review is the same, this is a bizarre film that has to be viewed to be understood. 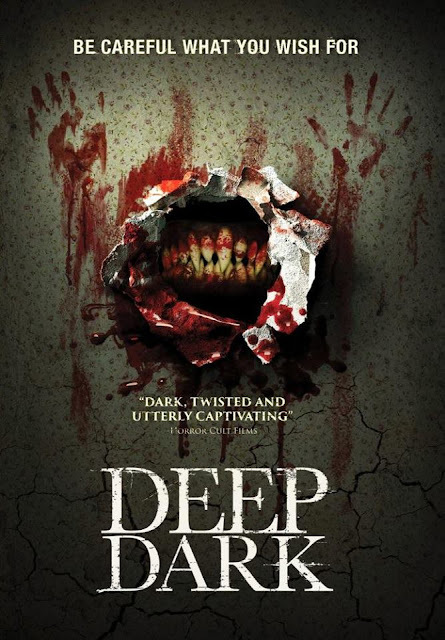 I wanted something different and refreshing and "Deep Dark" delivered that for me, it's definitely not for everyone but I urge you to give it a try.